Human beings, we’ve been told, are creatures of habit. If we do something one way on Tuesday, odds are we’ll do that same thing the same way on Wednesday. Sometimes that helps us. Think about those who floss regularly and can’t imagine otherwise. Other times, it can rot our brains and hollow our souls. Think about those who arrive home each night and unthinkingly switch on the TV. So how do habits come to be? And how can we change them? 1. All of us have a sense from our day-to-day lives of what a habit is. But you’ve dissected habits into a three-part loop. Explain. And give an example. In the last 15 years, as we’ve learned how habits work and how they can be changed, scientists have explained that every habit is made up of a cue, a routine and a reward. The cue is a trigger that tells your brain to go into automatic mode and which habit to use. Then there is the routine – the behavior itself – which can be physical or mental or emotional. Finally, there is a reward, which helps your brain figure out if this particular habit is worth remembering for the future. Over time, this loop — cue, routine, reward; cue, routine, reward — becomes more automatic as the cue and reward become neurologically intertwined. Take exercise. Studies have shown that people who identify simple cues and clear rewards are more likely to establish consistent exercise habits. If you want to start running in the morning, for instance, research indicates you’re more likely to succeed if you choose an obvious cue (like always putting on your sneakers before breakfast or leaving your running clothes next to your bed) and a clear reward (like a treat afterwards or the sense of accomplishment that comes from recording your miles in a log book). After a while, your brain will start anticipating that reward — craving the treat or the feeling of accomplishment — and there will be a measurable neurological impulse to exercise each day. 2. You write that a rather astonishing amount of what we do each day is unconscious and habitual rather than conscious and volitional. Should that alarm us? Does it mean we have a lot less free will than we think? One paper published by a Duke University researcher in 2006 found that more than 40 percent of the actions people performed each day weren’t the due to decision making, but were habits. In a sense, that’s alarming because when we’re in the middle of a habit, we’re thinking less. Our neurological activity literally decreases as the habit unfolds. That’s why the behavior feels so automatic, almost unconscious. But that doesn’t mean that habits are destiny. Habits can be ignored, changed, or replaced. And studies show that simply understanding how habits work — learning the structure of the habit loop — makes them easier to control. Once you break a habit into its components, you can fiddle with the gears. The secret, however, is to identify the cues and rewards driving particularly behaviors, and then adhere to what is known as the Golden Rule of Habit Change: only change one part of the loop at a time. To change a routine, for instance, keep the old cue and find a routine that delivers an old reward. Don’t try to change everything at once. 3. Let’s say that Pink Blog readers have a habit — eating junk food, frittering time away on email, procrastinating on big projects — that they’d like to eliminate. What’s the most effective step they can take? It’s important to understand that you can’t eliminate a habit – you can only change it for a better alternative. And the single most effective step is identifying the cue (what triggers the behavior) and the reward (what craving it satisfies.) For instance, I had a bad habit of eating a cookie every afternoon. To change it, I identified the cue by paying close attention to what preceded my cookie urge. Research indicates that most cues fit into one of five categories: location, time, emotional state, other people or the immediately preceding action. So whenever my cookie habit hit, I wrote down where I was, the time, how I felt, who else was around and what I had just done. Pretty soon, the cue was clear: I always felt an urge to snack around 3:30. I also needed to figure out the reward. So, I conducted a few experiments. One day, when I felt a cookie impulse, I went for a walk instead. The next day, I bought a coffee. The next, an apple. I wanted to test different theories regarding what reward I was really craving. Was it hunger? Or the desire for a quick burst of energy? Or, as turned out to be the answer, was it that I wanted to socialize, and the cookie was just a convenient excuse? Once I figured out the cue and reward, it was fairly simple to shift the routine. Now, every day around 3:30, I stand up, look around for someone to talk to, spend 10 minutes gossiping, then go back to my desk. The cue and reward have stayed the same. Only the routine has shifted, and I’ve lost 21 pounds since then. He was a great interview on NPR yesterday. This book has the potential to be EXTREMELY powerful… especially in my field: education. Randy: the NPR interview was fantastic. Say – how does a current subscriber get a copy of FLIP, without starting a second subscription to the blog? So much (book promotion-related) synchronicity! I’m reading this book because I’m scheduled to interview Charles tomorrow and I actually caught the tail end of the NPR interview yesterday. However, I didn’t realize who was being interviewed until I read the cookie story above, because that’s one of the stories he told. I was thinking of this when I read that finding from Duke about the habitual nature of our behavior. 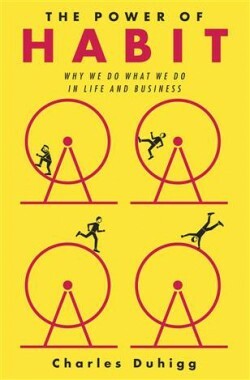 While I agree that Duhigg demonstrates that our habits can in fact be changed, it is important as well to recall that, at any given moment, we are not willfully deciding what we are going to do so much as running our established routines. So, to that degree, we are not in conscious control of what we are doing almost half the time! From what I’ve read, Charles is offering a fresh and well researched take on what is a subject often used as filler for the ‘self-help’ shelves. It makes a nice change. I really like the idea of breaking a habit down into its components to study what function it is filling and then systematically going about to find a healthier subsitute for meeting the underlying need. The most popular recommendation currently is to distract one’s self by engaging in a competing activity that keeps one from doing the undesirable behavior. In my experience, it has limited success as the underlying need driving the behavior is not met which in turn creates a stronger craving rather than reducing it. Serendipity is happening. Yesterday, I was checking over my goals list and decided it is time to change a few bad habits. Perfect timing for this blog of yours. What’s more, intuitively and experientially, I know the findings to be true. I am just in the BAD habit of ignoring the findings to continue crappy habits. Thanks for the great reminder and the the tip on a good read. I’ll buy it today. I am always on the hunt for great books and love sharing them. I missed this one, and am thrilled to see it featured here. Thought provoking. Thanks for your own great books and this great blog. There are so many great books out there to read (I am reading DRIVE x 2. I need more hours or read faster. I have to get to this one too.